Ritual hoard of copper objects from the Cave of the Treasure, Nahal Mishmar, present-day Israel, Late Chalcolithic period (4500–3500 BC). Copper. Israel Museum, Jerusalem. “Masters of Fire: The Copper Age in the Holy Land” is the first United States exhibition devoted to the art and culture of the Chalcolithic period (Copper-Stone Age, ca. 5500–3500 BC) in the Southern Levant (modern-day Israel and surrounding lands). The Chalcolithic period (Copper-Stone Age, ca. 5500–3500 BC) was an era of great social and technological development. Long before the pyramids were built in Egypt and writing was introduced in Mesopotamia, people in the Southern Levant—dwelling in the lands that today include Israel, Jordan, and their surrounding areas—were the first in the region to create metallurgy, temples, elaborate textiles, cash crops for export, and stratified societies. 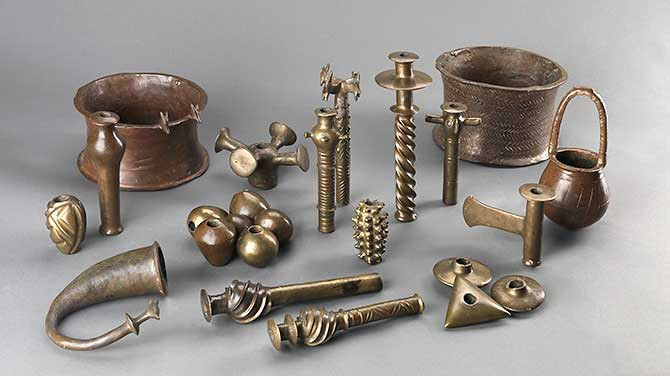 As early as the fourth millennium BC they employed sophisticated methods of smelting, alloying, and casting to produce small copper objects as ornaments and simple tools. In villages ruled by chiefs, artisans sponsored by this powerful emerging elite developed specialized skills in agriculture, ritual, and the creation of remarkable objects made from stone, terracotta, ivory—and metals, thanks to newly invented metallurgical techniques that were the most advanced of their time in the entire Near East. Masters of Fire is the first exhibition in the United States devoted to the art of this formative period and features oddly shaped zoomorphic ossuaries, basalt stands with human faces, hoards of copper ritual objects, linen and wool textiles, carved ivory human figures, and other hauntingly beautiful objects that illustrate how the technical, social, and aesthetic developments of this period laid the groundwork for later cultural expansion. The exhibition examines four distinct regions, each with its own set of independent traditions: the Golan plateau, the north-central plain, the Beersheba Valley/northern Negev, and the Jordan Valley. Together, their collective production reveals the lives of the people who inhabited the ancient Near East in its early stages of cultural formation.